Transitioning to working from home full time can be a much more complicated process than people may think. There are a lot of unexpected surprises that will come up and make you realize you are not properly prepared. 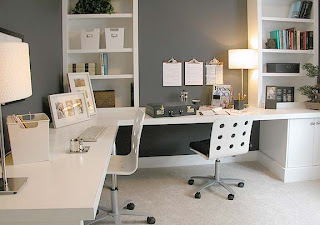 Here the things I think every successful home office needs. That old computer you bought to answer emails and share photos on facebook is probably not going to cut it when it comes to running a business full time from home. Once you start adding software to it that your business needs you’re going to find out it runs slow and crashes constantly. Instead of letting that happen and getting frustrated to the point of smashing it with a hammer, do yourself a favor and get a good computer. Nowadays they aren’t even that expensive and it will be the best investment you make in your home office. No I don’t mean like dueling banjos, I mean dual as in two monitors. I personally thought this wasn’t a big deal until I had to keep minimizing my windows to pull up a new one, then I had 10 open tabs on the bottom of my screen that all looked the same. I realized that for a few hundred dollars I could get two brand new monitors and be able to keep a document up on one screen while I edited it on another. Priceless. It makes no sense to invest in all this new equipment if you’re not going to take the most basic step to protect it. I live in an area where electrical surges are common, so I have surge protectors on everything I own. Having one on your computer hardware is just plain common sense. Most of them now come with a battery backup so even if your power goes down you still have up to 15 minutes to finish what you were working on and save it. This feature alone is worth the cost of the surge protector. First off, even an unsophisticated techie like myself had stopped using dial-up service. It’s slow even for just logging in to check email. But I didn’t realize the different speeds available for broadband. I purchased a basic DSL package from my phone carrier and thought I was riding high on the hog, until I had to watch my first video for my business from home. I didn’t realize it wasn’t supposed to be stop and go motion! And what did buffering mean because that was the only word I could read? Do yourself a favor and go for a medium speed broadband connection. It will save you a ton of time. Believe it or not this is actually different from a high speed internet. I didn’t have a clue. If your modem is not able to handle multiple internet connections like your computers, laptops, tablets or cell phones then you will get a data backlog and more often than not the modem will crash. That’s what the little red blinking light means. Instead of rebooting your modem two or three times a day, get yourself a high end modem that can easily manage incoming traffic from multiple sources. You may thing having speakers hooked up to your computer is enough. It’s not. Not in today’s multimedia world where everyone talks to everyone else through their computers. Between services like Skype or Ventrilo you are going to end up talking to people “over the net” almost as much as you do on your phone. To do this right you need a good quality headset so you can here who you’re talking to, and a noise canceling microphone so the person you’re talking with can hear you!. Having a printer is just not enough. You’re going to need it to be color if you want to do any kind of professional presentations. Plus for the price of a color printer you can nowadays get a multifunction machine. This is a color printer, fax machine, copier and scanner all in one. It is basically an entire room full of office equipment that fits on a corner of your desk. You can send and receive faxes, scan documents into PDF’s and email them, and do all of the things a successful home office needs to make money. There are days where the last thing you’ll want is to be tied to your desk, inside the house, for the whole day. A wireless network will give you the freedom to take your laptop or tablet and work anywhere around your house. Want to watch the kids playing outside and still get work done? A wireless home network is a must. This is especially important if you live in a rural area or someplace where a secure connection to the power grid is not always guaranteed. Let’s face it, no power means no work is getting done at all. With a small, portable generator you can make sure your business isn’t shut down just because the power is. Some of the more affordable household portable generators are the Yamaha portable generator and Duromax portable generator. Make sure you check around online because there are plenty of Duromax generator sales where you can save some cash.